I saw Harry Potter and the Deathly Hallows part 2 yesterday, and it was pretty good. I liked how they freed the dragon and I like Neville’s speech to the bad guys, But, as one of your commentators said in a previous post — this story sure REMINDS me of a lot of other ones. So, what sources –besides Star Wars and the Lord of the Rings – do you think JK Rowling borrowed from? And like that other guy who posted asked – isn’t that plagiarism? Finally – how did you like the movie? The New Yorker’s David Denby refers to a couple of important sources when he notes that the latest Harry Potter movie is a kind of “Götterdämmerung for 8 year olds” and that Harry is a mash up of Jesus and Siegfried. The Jesus reference is obvious, but the other one bears some explanation. Denby is referring to Richard Wagner’s operas, called the “Ring Cycle” — which are themselves based on very old pre-Christian Scandinavian and Germanic legends. Those legends – which you can read about in Edith Hamilton’s or Bullfinch’s books (or get a quick feel for by glancing at the appropriate Wikipedia entry) — repeatedly return to a struggle between forces which will result in a sort of Armageddon, which they call Ragnarök. 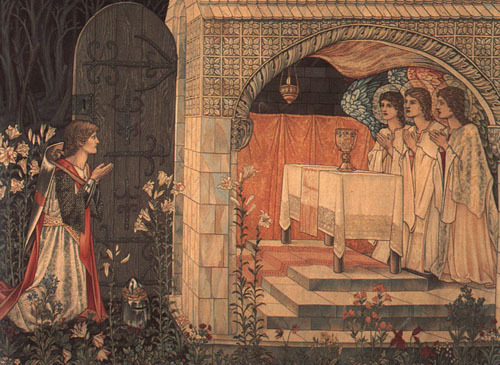 When Christianity arrives in Northern Europe, those stories become the under-layer for new Christian tales – of which the King Arthur series is the best known example. If you are interested in old European literature – take a look at any newish translation of Beowulf, Gawain and the Green Knight, and Wolfram von Eschenbach romance Parzival or the de Troyes version. This last story is the basis for many of the heroic quest tales that we see all over the place. Parzival or Perceval (the French spelling), is a knightly hero who is hidden away on a farm (you can see the Luke Skywalker material here as well as Harry’s and for that matter, Neo of The Matrix), and does not know his true identity. Yet, he is determined to be a knight and sets forth to claim his destiny and makes a bunch of mistakes – some comical, some very serious. The Holy Grail is involved (Goblet of Fire, Anyone?). And a wounded king is involved (Dumbledore). Take a read, or see the very strange movie made about the story in the 90’s by Eric Rohmer if you can get hold of it. But some of these ideas go back much further in time, and are not, originally at least, Western. The Indo-Iranian prophet Zoroaster talks about the Noble Ones who must defeat the others – an idea, which religious history scholars like Mark Muesse argue is the basis for the many crucial world religions that grow out of this ancient culture, including: Hinduism, Buddhism, Judaism (with its branch off religions, Christianity and Islam), and so on. See the map on the Axial Age website for an idea of how central this place and these ideas are. So those are the some of the bases for the Harry Potter series, and I do think they are worth taking a look at, if you are interested. As to your question – is this kind of borrowing plagiarism? Taking from stories and images that already exist, riffing on them, and even outright imitating them have been legitimate creative activities for millennia. The concept of “originality” is a very new one, historically (beginning in Europe in the late 18th Century with the advent of the paperback and writing for commercial purposes) and, as any copyright /intellectual property lawyer can tell you, the idea of artistic originality is a highly problematic one. Art making and story telling are very social acts, and as such are collaborative in nature. That is not to say that there aren’t real limits to the Harry Potter series; I say nothing new by observing that the characters inhabit a Eurocentric, white, Christian, and straight universe. Rowling’s comment in an interview that Dumbledore is of course gay does nothing to rectify the pretty straight-laced (ahem) heteronormative pairings of both the adults and the students. That said — yes, I did like the last movie, and I have read and enjoyed all the books. I too liked the dragon, and I have been a longtime Neville Longbottom fan and was thrilled by the visual depiction of that character on screen (Thank you Matthew Lewis!). The New York Times mockingly compared Neville’s speech to Voldemort to a corny version of Henry V’s “St. Crispin’s Day speech”. But I and at least one other magical realist in the audience this past Friday found it the most moving moment in the movie. On the twitter feed this weekend, someone posted that HP taught them the power of the imagination and the value of idealism. I think that’s a great take-away. Thinking about Neville limping over to Voldemort and quietly affirming his commitment to rightness and fairness and opposing himself against the fascism of Voldemort and Co. feels very important to us over here at Magically Real. May we all find the courage and the community to do that in our real lives. Having, at this moment, yet to see the final installment (and the 2 of the previous 6 films that link up the plot of the last one), my comments must be brief. I find the Eurocentricity or, potentially more accurately, the Anglo-centricity (“Anglo” in the broader application that encompasses all that is British) to be nothing new to British literature and pop culture. This I believe to be the residual effect of Victorian Imperialism amplified through Churchillian patriotism that has survived the ages, albeit in a less potent yet still inquisitively British form. An example of this could be found in the longest running British sci-fi show, Doctor Who, and their continued return to hallmark moments in British history (such as World War II, late Victorian era and the Elizabethan Age). In Harry Potter, the very setting of Tudor style castles, travels across long expanses of English countryside, even the transportation provided by British (Welsh to be precise) steam power. The heteronormative pairings of Harry Potter does seem anomalous in contemporary British media. General trends in British pop culture appear to actively, perhaps not consciously though, dissolve barriers of color as well as sexual orientation a la Captain Jack Harkness and company, as well as others. This may yet be attributed to Rowling’s continued play on Medieval literature where all heroes get the damsel in distress. In addition to the list of alleged “source material”, I think comparisons can also be drawn between Harry Potter, Madeline L’Engle’s “Wrinkle in Time” series and several books written by Roald Dahl. I attribute these connections mostly in the constructs of Rowling’s characters and the notions of depravity in the foster care of one’s own family after the death of one’s parents. By using these elements from other works, Rowling is creating a world of antiquated idealism that would have been right at home in the ’50s. In any case, I intend to see the film in theaters this week because, what the heck, it’s summer and why not. I fancy myself a collector of sorts of pre-battle speeches. As such, I suppose I look forward to seeing Rowling’s take on it. I also look forward to the destruction and chaos of a Megiddo-style battle. I’ll undoubtedly have more to say after I’ve seen it. Thanks Owen for this thoughtful comment. The purpose of the entry today was to signal the older connections rather than the 20th Century ones — such as L’Engle and of course CS Lewis. What Dahl are you thinking of? The kid lit? Or the adult sf? The prevalence of an Americanized projection of a retro British outlook here in the “colonies” is an interesting thought. We can see that projection at work on Texan writer George RR Martin and the GAME OF THRONES project too. Is Nolan doing something similarly retro and nostalgic in his work? The speech in question in the film is actually a post-battle speech or rather in the thick-of-it speech, and it’s effective. I wonder what one makes of the fact that LE MONDE reviewed the movie very favorably and saw it in terms of the Western! The Dahl to which I refer is his kid lit mostly (being unfamiliar with his adult sf), specifically James and the Giant Peach, Matilda, Boy and The Twits. The parallel I find is the divide between Harry and his magical world and the real world inhabited by his aunt and uncle (Matilda and James and the Giant Peach). The child feels marooned in realism. He feels an inherent comfort in his birthright of magic, but a tragic depravity at the hands of reality, thus forcing his escape to Hogwarts and his adoption of various parental figures. This inevitably reinforces a barrier between the world of magical and the insanely real, child and adult (Boy and The Twits). It becomes a competition of sorts between two worlds that refuse to recognize each other and occasionally becoming hostile (the snake incident in the first movie). In Dahl, like in Harry Potter, the magical world always ends up punishing the unjust and harsh reality personified in certain adults by eliciting the power of the supernatural. It’s interesting you mention Nolan. I was just watching Batman Begins last night. I think the potential for retro and nostalgia is there, I just honestly wasn’t looking for it. I’ll give The Dark Knight a watch and let you know my findings. Hmmm… Harry Potter as a Western? I suppose the Western stereotypes of vengeance and/or a besieged underdog with rampant badassery is apparent, but I think it is certainly downplayed given the initial target audience. Harry Potter, at least in the early films, isn’t out for blood for Voldemort’s murder of his parents. Inevitably, and I think it is true with these final installments, that unresolved tension has come full circle and now the vengeance is real, but only when his surrogate home and adopted parental figures are at stake or dead. Great comparison of Harry Potter and James and the Giant Peach! There is a film version of the latter, which we haven’t seen over here, but know about. It’s interesting how the French would read the HP story as American West-related…. but then they are fascinated by the Western as a genre. Thanks for posting.